August 23 - Saint Rose of Lima, Virgin - Optional Memorial - My Catholic Life! Today’s saint was born Isabel Flores de Oliva in colonial Spain, today’s Peru, to a middle-class Catholic family. She took the name “Rose” when she was confirmed by Lima’s bishop, the future Saint Turibius of Mongrovejo. “Rose” had been her nickname since infancy after a servant said that she was as beautiful as a rose. Young Rose was indeed beautiful and attracted the attention of various suitors. But she had decided from a young age to give herself to Christ alone, so she actively deterred male interest by cutting off her hair, blistering her face by rubbing pepper into her pure skin, and by damaging her feminine hands with the acidic juice of limes. Her natural affinity for the things of God was not reciprocated by her father, who blocked her desire to enter a Dominican convent as a nun. Instead, Rose became a Third Order Dominican, a lay woman dedicated to living Catholicism in accord with Dominican spiritual ideals outside of the cloister. But Rose pushed her Third Order spirituality beyond its natural limits. She lived poverty, chastity, obedience and numerous other virtues far more rigorously than most professed nuns. Bending somewhat to his daughter’s desires, Rose’s father allowed her to live apart from the family in a small hut on his property. From that hut, and from a room in the family home where she cared for the sick and the poor, Rose became famous throughout Lima. Rose’s fame was due to her generous care for the sick but, perhaps most of all, due to her extraordinary austerities and some related miraculous events. Rose’s spiritual model was Saint Catherine of Siena, the fourteenth century Italian mystic who was also a Dominican tertiary. Saint Catherine also lived at home, was from a large family like Rose, and had a high, a very high, threshold for physical pain and suffering, just like Rose. Rose did not fast on certain days or at certain times. She fasted from life itself. She seemingly ate only Holy Communion. What little she did consume she would often force herself to vomit up afterward. She ate no meat, slept on a bed of tile shards, and wore a crown, disguised with flowers, equipped with small spikes which pierced the thin, taut skin wrapped over her skull. Saint Rose’s short life was, on one hand, the full, ripened fruit of sixteenth century Spanish mysticism—pious, mortifying, Christocentric, and theologically orthodox. From a different perspective, Rose’s sustained and extreme mortifications were on the far margins of psychologically healthy. Her self-attacks would today be considered expressions of bulimia, mental instability, and self-hating to the point of illness. But Rose is not here to be interviewed on the Freudian couch, and to describe her personality, in any case, is not to judge it. Saint Rose lived a model life for her era, was clearly motivated by love of God, and expressed such control over her natural, corporeal needs that sanctifying grace as her hidden strength cannot be discounted. Rose died in the perfume of holiness at the age of thirty-one. Her funeral was held in Lima’s Cathedral with all local dignitaries in attendance. She was beatified in 1667 and canonized in 1671. She is interred in the same church as Saint Martin de Porres in central Lima. Her pre-Vatican II feast day of August 30th is a national holiday in Peru and her image graces that country’s highest denomination currency. She is known as a powerful miracle worker credited with numerous physical healings unto today. 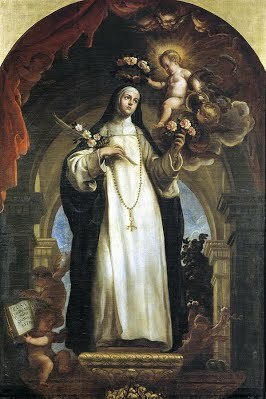 Saint Rose of Lima, you were young and holy. You dedicated your body and soul to God while still a child. Through your example, and through your heavenly intercession, help all Catholics, especially the young, to dedicate their lives to God from the very start. THIS lovely flower of sanctity, the first canonized Saint of the New World, was born at Lima in 1586. She was christened Isabel, but the beauty of her infant face earned for her the title of Rose, which she ever after bore. As a child, while still in the cradle, her silence under a painful surgical operation proved the thirst for suffering already consuming her heart. At an early age she took service to support her impoverished parents, and worked for them day and night. In spite of hardships and austerities her beauty ripened with increasing age, and she was much and openly admired. From fear of vanity she cut off her hair, blistered her face with pepper and her hands with lime. For further security she enrolled herself in the Third Order of St. Dominic, took St. Catherine of Siena as her model, and redoubled her penance. Her cell was a garden hut, her couch a box of broken tiles. Under her habit Rose wore a hair-shirt studded with iron nails, while, concealed by her veil, a silver crown armed with ninety points encircled her head. More than once, when she shuddered at the prospect of a night of torture, a voice said, “My cross was yet more painful.” The Blessed Sacrament seemed almost her only food. Her love for it was intense. When the Dutch fleet prepared to attack the town, Rose took her place before the tabernacle, and wept that she was not worthy to die in its defence. All her sufferings were offered for the conversion of sinners, and the thought of the multitudes in hell was ever before her soul. She died in 1617, at the age of thirty-one. Reflection.—Rose, pure as driven snow, was filled with deepest contrition and humility, and did constant and terrible penance. Our sins are continual, our repentance passing, our contrition slight, our penance nothing. How will it fare with us?